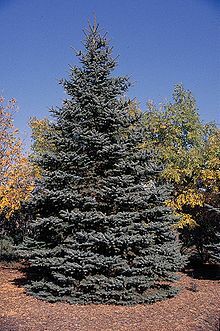 The blue spruce, green spruce, white spruce, Colorado spruce, or Colorado blue spruce, with the Latin (scientific) name Picea pungens, is a species of spruce tree. It is native to Canada and the United States, and is found in growing zones 1 through 7. Its natural range extends from northern New Mexico through Colorado and Utah to Wyoming and into Alberta and British Columbia, but it has been widely introduced elsewhere and is used as an ornamental tree in many places far beyond its native range. 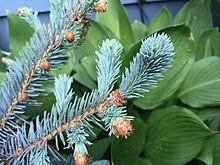 The blue spruce has blue-green coloured needles and is a coniferous tree. In the wild, Picea pungens grows to about 23 m (75 ft), but when planted in parks and gardens it seldom exceeds 15 m (49 ft) tall by 5 m (16 ft) wide. It is a columnar or conical evergreen conifer with densely growing horizontal branches. It has scaly grey bark on the trunk with yellowish-brown branches. Waxy gray-green leaves, up to 3 cm (1 in) long, are arranged radially on the shoots which curve upwards. The pale brown cones are up to 10 cm (4 in) long. Blue spruce seedlings are shallow roots that penetrate only 6.4 cm (2.5 inches) of soil during the first year. Although freezing can’t damage much in blue spruce, frost will cause seedling loss. Shadows in late spring and early autumn minimize this frost heaving loss. Despite the shallow roots, blue spruce is able to resist strong winds. Five years before transplanting, the total root surface area of 2-meter-high trees was doubled by pruning the roots of blue spruce. It also increases the root concentration in drip irrigation pipeline from 40% to 60%, which is an advantage in landscape greening. Blue spruce generally exists on gentle uplands and sub irrigated slopes, in well-watered tributary drainage, extending down intermittent streams, and on lower northerly slopes. Blue spruce always grow naturally in the soils which are in the order Mollisols, and the soil will also be in the orders histosols and inceptisols in a lesser extent. Blue spruce is considered as a pioneer tree species in moist soil in Utah. Blue spruce usually grows in cool and humid climatic zones where the annual precipitation is mainly occurred in summer. Blue spruce is most common in Colorado and the Southwest. The annual average temperature ranges from 3.9 to 6.1 degrees C (39 to 43 degrees F). And ranges from - 3.9 to - 2.8 degrees C (25 to 27 degrees F) in January. In July, the average temperature ranges from 13.9 to 15.0 degrees C (57 to 59 degrees F). The average minimum temperature in January ranges from - 11.1 to 8.9 degrees C (12 to 16 degrees F), and the average maximum temperature in July ranges from 21.1 to 22.2 C (70 to 72 degrees F). There is a frost-free period of about 55 to 60 days from June to August. Annual mean precipitation generally vary from 460 to 610 mm (18 to 24 in). Winter is the season with the poorest rainfall, the precipitation is usually less than 20 percent of the annual moisture falling from December to March. And fifth percent of the annual precipitation occurs during the growing season of the plants. Blue spruce is generally considered to grow best with abundant moisture, nevertheless, this species can withstand drought better than any other spruce. It can withstand extremely low temperatures (-40 degrees C) as well. Furthermore, this species is more resistant to high insolation and frost damage compared to other associated species. ^ A. Farjon (2013). "Picea pungens". The IUCN Red List of Threatened Species. 2013: e.T42333A2973433. doi:10.2305/IUCN.UK.2013-1.RLTS.T42333A2973433.en. Retrieved 13 January 2018. ^ "Picea pungens: Blue Spruce, Colorado Blue Spruce, or Green Spruce (Pinaceae - Pine Family)". ^ "Blue spruce, Picea pungens Engelm., Plant Symbol = PIPU" (PDF). USDA NRCS. ^ "Colorado Blue Spruce". treecanada.ca. Retrieved 2018-11-20. ^ a b Barnes, Burton V.; Warren J. Wagner Jr. (September 15, 1981). Michigan Trees: A Guide to the Trees of Michigan and the Great Lakes Region. Biological Science Series. University of Michigan Press. ISBN 978-0-472-08018-2. ^ Vedel, H.; Lange, J. (1962). Trees and Bushes. Methuen & Co. pp. 119–120. ISBN 978-0416617801. ^ "State Trees & State Flowers". United States National Arboretum. June 11, 2009. Archived from the original on 2010-12-06. Retrieved 2010-05-26. ^ a b Gilman, Edward F.; Watson, Dennis G. (2011-05-01). "Picea pungens: Colorado Spruce". EDIS. IFAS Extension Service: University of Florida. Retrieved 2013-10-06. ^ Cranshaw, W. S. (2013-06-13). "Scale Insects Affecting Conifers". Colorado State University Extension. Retrieved 2013-10-05. ^ Ciesla, Bill (2013-04-19). "Spruce Beetle Threatens High Country Spruce Forests". Colorado State University Extension. Retrieved 2013-10-05. ^ Jones, John R. "Southwestern mixed conifers. In Silvicultural systems for the major forest types of the United States". U.S. Department of Agriculture, Agriculture Handboo. ^ Alexander, Robert R. "Silviculture of central and southern Rocky Mountain forests. USDA Forest Service, Research Paper RM-120". Rocky Mountain Forest and Range Experiment Station, Fort Collins. ^ Pearson, G. A. "Forest types in the Southwest as determined by climate and soil". U.S. Department of Agriculture, Technical Bulletin 247. ^ Goor, A. Y.; Barney. Forest tree planting in and zones. Ronald Press. ^ Watson, Gary W; Sydnor. "The effect of root pruning on the root system of nursery trees". Journal of Arboriculture. ^ "AGM Plants - Ornamental" (PDF). Royal Horticultural Society. July 2017. p. 78. Retrieved 25 April 2018. ^ "RHS Plant Selector – Picea pungens 'Globosa'". Retrieved 27 May 2013. ^ "RHS Plant Selector - Picea pungens 'Hoopsii'". Retrieved 27 May 2013. ^ "RHS Plant Selector – Picea pungens 'Koster'". Retrieved 27 May 2013. ^ "Missouri Botanical Garden - Picea pungens 'Baby Blueeyes'". ^ "Washington State University - Picea pungens 'Baby Blueeyes'". ^ "West Montrose Farms Ltd - Picea pungens 'Baby Blue'". ^ a b Fechner, Gilbert H. "Blue Spruce". Retrieved 2018-11-22. ^ Mauk, Ronald L.; Henderson. "Forest habitat types of northern Utah. USDA Forest Service General Technical Report INT-170". Intermountain Forest and Range Experiment Station. ^ Moir, William H.; Ludwig, John A. "A classification of spruce-fir mixed conifer habitat types of Arizona and New Mexico". USDA Forest Service, Research Paper RM-207. ^ Dixon, Helen (1935). "Ecological Studies on the High Plateaus of Utah". Botanical Gazette. 97 (2): 272–320. JSTOR 2471603. ^ a b Fechner, Gilbert H. "Blue Spruce". Retrieved 2018-11-23. ^ a b Bates, Carlos C. "Forest types in the central Rocky Mountains as affected by climate and soils". U.S. Department of Agriculture, Bulletin 1233: 152p. ^ Pearson, G. A. "Forest types in the Southwest as determined by climate and soil". U.S. Department of Agriculture, Technical Bulletin 247: 144p. ^ Goor, A. Y. (1977). "Forest tree planting in arid zones". Soil Science. 124 (1): 504p. Bibcode:1977SoilS.124...66C. doi:10.1097/00010694-197707000-00012.